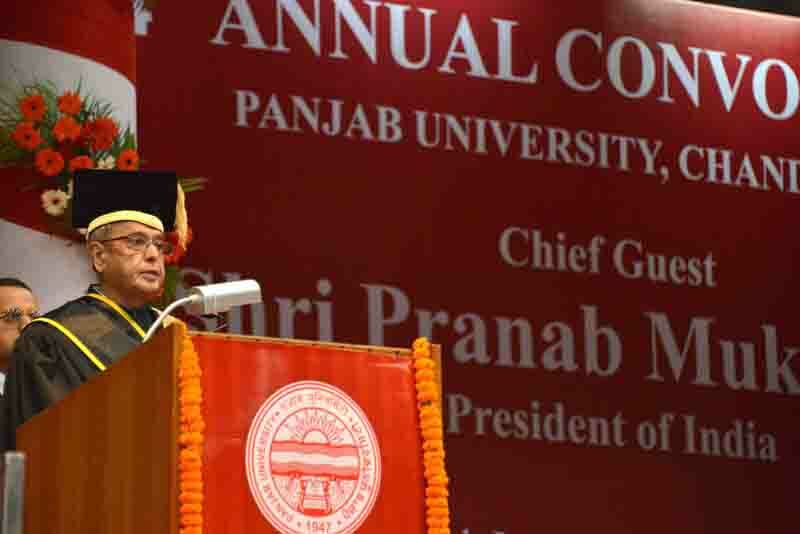 1.I am happy to be here today and be a part of this Sixty Fourth Convocation of Panjab University, one of the country’s oldest and leading centres of higher education. At the outset, let me thank the University for inviting me and giving the opportunity to address this august gathering. 2.Punjab University has a long history dating back to the Nineteenth Century. It was established in 1882 at Lahore as the University of Punjab. In 1947 after India’s Independence, it was re-established at Shimla as the East Panjab University. Consequent to the re-organization of the State of Punjab in 1966, Panjab University with its main campus in Chandigarh acquired the status of an ‘inter-state body corporate’, which is unique for an educational institution in our country. 3.Punjab University is today a vibrant centre of higher learning. Its 78 Departments, four Chairs and four Regional Centres profess in the wide range of faculties from Arts to Science, Law, Management, Engineering, Medicine and Agriculture. With a long tradition of pursuing excellence in teaching and research, several departments of this prestigious University are covered by the University Grants Commission (UGC) and the Department of Science and Technology for special assistance and fund support. Two centres of excellence – one, on nano technology, and the other, on gender audit – were supported by the UGC during the Eleventh Plan period. With facilities for Stem Cell Research and Drug Development, Panjab University has also been recognized by the UGC as a "University with Potential for Excellence in Bio-medical Sciences". This University has research collaborations with leading research and technology institutions in India and abroad. 4.Punjab University has educated generations of students, many of whom have risen to occupy eminent positions in various walks of life. It counts amongst its distinguished alumni a former Prime Minister and such others including Nobel Laureate Late Dr. Har Gobind Khorana, leading figures in public life and civil servants. That this University has excelled in providing quality education has been recognized internationally. It is heartening to note that at the 276-300th bracket in the Times Higher Education Survey 2014-15, Panjab University is the highest-ranked Indian institution. I applaud you all for this achievement. I am confident that you will touch greater heights through the same spirit of dedication and commitment. 5.Let me congratulate you on coming out successful and deserving of this joyous occasion in your life. I can see a palpable sense of delight in you. In this moment of glory, you must comprehend the hopes and expectations that your near and dear ones, the society and the nation at large have from you. India is a shining example of democratic polity and pluralistic society. Democracy not only gives rights but also entails responsibilities. Educated youth must play a vital role in building a resurgent new India. Your education has given you an opportunity to make a difference. This is the time to engage with our beautiful, complex, and sometimes noisy democracy. I am particularly happy to note that two thirds of the PhD graduates are women. My special congratulations to them. 6.Competent and committed individuals are necessary to build the country of our dreams. Our universities must produce men and women of character and integrity. Mahatma Gandhi had said and I quote: "Real education consists in drawing the best out of yourself. What better book can there be than the book of humanity? (unquote)" Bapu's call to follow the book of humanity can resolve the dilemmas of society today. I am confident that you will live your dream, and that of your country and countrymen. 7.A country’s ascent is determined to a large extent by human capital. As such, education plays a decisive role in shaping the destiny of nations. At the apex of the education system is the university. Indian universities have potential to be the leading institutions in the world. For that, urgent improvements in academic management are needed. To make learning more effective, teaching pedagogy must be refined, curricula up-dated regularly, an inter-disciplinary approach adopted and evaluation mechanism reformed. To make faculty up-to-date in their field of knowledge, faculty recharge programmes must be conducted. To pursue excellence, core competencies must be identified and centres of excellence nurtured. To create quality consciousness, every institution must be benchmarked and accredited. o One, it can gain from interacting with other academic institutes in India and abroad through: exchange of faculty and students; participation in seminars and workshops; joint research papers; collaborative research; and sharing of academic resources like course material and resource persons. It would be worthwhile to make full use of the National Knowledge Network in these endeavours. o Two, an industry interface can benefit in terms of: involvement of industry personnel in curriculum design and project guidance; sponsorship of chair positions; and setting up of incubation centres and laboratories. These could be facilitated through an industry-interface cell as well as by induction of industry experts in governance mechanisms. ·Three, an institute can reach out to its alumni who retains an emotional connect with their alma mater. Some of them could be associated for academic management through governing bodies; and for business and project mentoring and curriculum design. 9.Higher educational institutions would do well to recognize emerging global trends that are creating new models of knowledge dispensation. Rising costs of higher education and changing profile of education seekers, aided by technology, has led to Massive Open Online Courses (MOOCs). Due to its advantage of speed, scale and efficiency, it is fast catching up as the preferred mode of learning. Blended MOOCs - online instruction supplemented by periodic classroom interaction – also have the potential to gain ground. Choice-Based Credit System has been introduced that will provide students mobility across the higher educational system. Universities must note these evolutions in education and take steps to maximize benefits. 10. Many innovative ideas are born out of the ingenuity of the common man. Mentoring them to validate ideas and design viable products calls for the development of an innovation value-chain. Higher learning institutions, due to their multiple linkages, can propel this eco-system. Many central institutions have started Innovation clubs to spur an innovation culture and translate ‘inclusion in innovation’ into a workable framework. Your University is a pioneer on many fronts. You, too, can open such a club and link some of the ingenious ideas of grassroots innovators in this region to innovation incubators in technical and research institutions. 11. A scientific temper, which takes one’s imagination beyond the realm of grades and classroom, is essential in our students. Our institutions must fire the power of imagination of their students. The teacher must encourage the taught to think beyond books, question concepts and accept a proposition only after investigation. Students must have a grand vision which they can, through research and inquiry, translate into reality. 12.With these words, I conclude. I once again compliment the graduating students and wish them a bright future ahead. I also wish the management and faculty of Panjab University the very best for the future.